Kadena Air Base resumed HH-60 rescue helicopter flights on August 16. 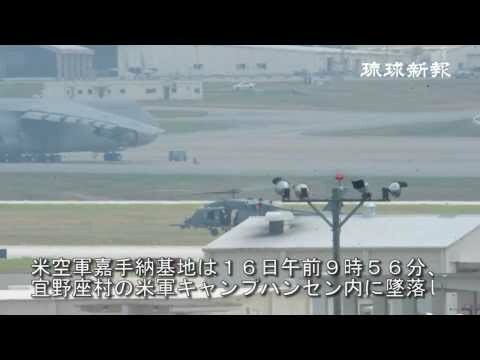 The U.S. military had suspended flight training for the HH-60 helicopter after one crashed in the Central Training Area near Camp Hansen in Ginoza on August 5, so only eleven days had passed since the accident. An U.S. Air Force official commented that they are confident in their ability to safely resume operational and training flights, but the cause of the crash remains unclear. The municipalities, including the Okinawa Prefectural Government, Ginoza Village and Kadena Town, reacted by stating that resumption of the HH-60 flight training is regrettable and unacceptable. At the Japan-U.S. Joint Committee Meeting on August 15, U.S. officials commented that the investigation would take more time to identify the specific cause of the accident. That day, three HH-60s circled many times over residential areas of Kadena Town. Local residents also saw the helicopters near four U.S. military bases in the northern part of the main island. They carried out intense flight training, including sharp turns. At 9:30 a.m., the helicopters began to turn their rotors in front of the hangars at Kadena Air Base along National Highway No. 58, taking off from the base just before 10:00 a.m. They circled many times over Kadena Town between noon and 1:30 p.m. and by evening had passed over the Furugen district of Yomitan Village and the Hijagawa River towards the sea at least nine times. The helicopters flew over the four districts, including the Central Training Area, where the HH-60 crashed, the Northern Training Area and Blue Beach. People confirmed that the helicopters crossed over Prefectural Road No.70 and flew making sharp turns. 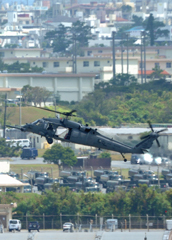 By 6:45 p.m., all the helicopters had returned to Kadena Base. At the U.S.-Japan Joint Committee meeting, Japanese officials requested that the U.S provide information on the cause of the accident as soon as possible. The U.S side explained that the investigation would take time to identify the specific cause, and that they will strive to provide information quickly to Japan. After the U.S. Air Force releases the results of investigation, officials from both countries’ foreign and defense ministries will discuss the safety of flight operations.